Autophagy appears to have differing roles in varied types of breast cancer cells. Autophagy plays a complex role in tumor initiation and progression. MicroRNAs (miRNAs) are non-coding small RNAs that play an important role in the post-transcriptional regulation of gene expression. Recent studies indicated that miRNAs are also mediators in breast cancer progression. A thorough understanding of the molecular mechanisms controlling autophagy in homeostasis may eventually allow for the manipulation of the process specific target of breast cancer migration and invasion in therapeutic applications. Results demonstrate how a breast cancer cell model can be used to study the relationship between miRNA-200c and miRNA-205, and autophagy. Confocal microscopy was utilized to examine changes in autophagic flux. This study revealed that miRNA-200c and miRNA-205 were altered significantly in autophagic flux in comparison with the FDA-approved drug (chloroquine-CQ) in the BT549 and MCF7 breast cancer cell types. Breast cancer, is the second most common malignant tumor in women worldwide (Figure 1) . Many etiological factors such as a wide spectrum of clinical manifestations caused by family clustering, hormonal factors, lactation, early menarche, metabolic and secretary factors, obesity, dietary factors, alcohol consumption, smoking, and lose-dose irradiation. On top of that, obesity, alcoholism, and tobacco smoking were found and suggested to result in this incidence [2-4]. Although there are many FDA-approval drugs for breast cancers. Breast cancer is an extremely heterogeneous disease with an equally heterogeneous response to drugs, and individual has inherited different genetic background . Thus, it is hard to find an effective treatment and it may recur after recovery from first treatment. Epithelial-Mesenchymal Transition (EMT) is known morphology changes from epithelial phenotype to mesenchymal phenotype in cells which resulted in loss of cell-cell adhesion and cell polarity (Figure 2). This process occurs during embryonic development, wound healing, tissue regeneration, organ fibrosis, and tumor progression. During EMT, cells had increased motility and invasiveness, tumor-propagating potential, and resistance to apoptosis and antitumor drug. During EMT, cellular process is not only limited in the morphological change, epigenetic profile (genes and miRNAs turnover) and proteomic profile (protein turnover), respectively (Table 1). Autophagy has been indicated as another important catabolic pathway involved during EMT process to overcome intracellular or environmental stress, such as nutrient deprivation, hypoxia, drug effects, motility and metastatic potential, further to changes in epigenetic and proteomic profiles . Autophagy is derived from the Greek words auto, which means “self”, and phagy, which means “to eat”. The autophagic process breaks down cellular components and plays a particularly important role during periods of starvation, or when organelles are damaged . This allows cells to balance synthesis, degradation, and recycling of cellular structures. Autophagosomes are double-membrane cytosolic vesicles that encapsulate superfluous or damaged cellular components and break them down to either supply nutrients to the cell or fine-tune organelle content [8-10]. Not surprisingly, then, during development autophagy plays a significant role in cell growth, and in homeostasis. Macroautophagy, often referred to simply as autophagy, involves the formation of double membrane vesicles around organelles and other cytoplasmic components that then fuse with lysosomes . Different miRNAs have been found to maintain protein translator and homeostasis in enriched breast-cancer subsets. Furthermore, miRNA biogenesis and regulation are involved in selective autophagy. MicroRNAs (miRNAs) are short non-coding RNAs that regulate the function of target genes at the post-transcriptional phase. miRNAs are known involved in disease processes. miRNAs regulate gene expression post-transcriptional by binding to the 3’-Untranslated Regions (3’UTR) of a target mRNA and inhibited translation . Different miRNAs have been found to enriched in breast cancer subsets and maintain in protein translation homeostasis [13-16]. Furthermore, miRNA biogenesis and regulation are involved with selective autophagy . To antagonize the function of miRNAs, several antagomirs have been engineered and are commercially available. On the contrary, miRNAs effect can be enhanced with miRNA mimics, which are chemically modified short double-stranded RNA sequences. Recent studies have suggested a role of miRNA in modulating breast cancer cells. The two-major miRNA are miRNA-200c and miRNA-205 which were thoroughly studied, and data suggested that miRNA-mediated control of EMT Non-coding miRNAs that selectively bind mRNAs, thus inhibiting their translation or promoting their degradation, also regulate the epithelial phenotype and EMT . Members of the miR-200 family and miR-205 repress the translation of ZEB1 and ZEB2 mRNAs, and double-negative feedback controls ZEB and miR-200 expression, with ZEB proteins repressing the expression of miR-200 miRNAs, and miR-200 suppressing ZEB expression . During EMT, decreased miR-200 expression results in increased ZEB1 and ZEB2 levels and EMT progression . Additionally, p53 represses liver carcinoma cell EMT by increasing the expression of miR-200 and miR-192 (a miR-215 homologue), which target and reduce ZEB1 and ZEB2 expression [21,22]. MDA-MB-231 (basal B), BT459 (basal B), and MCF7 (luminal) cells were cultured in DMEM with high glucose supplemented with 10% fetal bovine serum and 1% of 100 units/ml penicillin/streptomycin (100x stock) (Table 2). The following synthetic miRNA mimics were used in this study: Mimic (control, hsa-miR-200c-3p, and hsa-miR-205-5p), and inhibitor (control: control, hsa-miR-200c-3p, and hsa-miR-205-5p) purchased from Ambion. 200 pM miRNA (Ambion) was transfected into cells using Trans-Bra transfection reagent (Invitrogen) compared to a scrambled control miRNA. Cells were incubated at 37ºC, 5% CO2 for 24 or 48 hours respectively, and harvested with RIPA buffer for immunoblotting. Unmodified miRNA mimics were obtained from Ambion and proprietary modified miRNAs (designed for selective incorporation of the guide strand into RISC) are from Ambion. Cells were seeded at 1x106 per 6 cm culture dish and treated under conditions equal to those chosen for the immunocytochemistry. Cells were lysed in ice-cold RIPA buffer supplemented with protease inhibitor (Roche) for protein extraction. The total protein concentration was determined using a spectrometer. Equally loaded proteins were separated in 8% and 20% SDS-PAGE gels and then transferred to nitrocellulose membranes. The membranes were probed with the following: (1) Rabbit monoclonal anti-LC3 (1:1000, Cell Signaling Technology), (2) Mouse monoclonal anti-ZEB1 antibody (1:500, Santa Cruz, USA), and (3) Mouse monoclonal anti-actin antibody (1:5000, Sigma) at 4ºC overnight (Table 3). The primary antibodies were detected using a horseradish peroxidase-conjugated anti-rabbit (1:5000 or anti-mouse (1:5000) goat secondary, respectively. Blotting was visualized with a Chemiluminescence (ECL) kit; then, the membrane was exposed to chemiluminescence imaging system. Cells were fixed and incubated with primary antibodies at a dilution of 1:100, fluorescence dye-conjugated secondary antibodies, and Hochester 33342, according to standard protocols. Cells were examined using a confocal microscope (Olympus) with a 60x oil immersion objective. Total numbers of LC3B-GFP puncta per cell in a frame was quantified by using ImageJ, and the Analyze Particles Plug in (a constant threshold for all the images within each experiment was applied). One hundred cells per condition were used for quantification. To quantitate the autophagosome per sample, open the digital image in the image analysis software and measure the entire cross-section area of the frame. This can be done by setting the threshold compared with the original image to ensure there has little information lost during threshold set. Second, identify and manually measure by analysis particles. Then exported the excel for statistical analysis. Data is represented as mean ± S.E.M. N values indicate the number of images. Images were taken in a blinded fashion. Signiﬁcant differences between experimental groups were measured by the GraphPad Prism with statistically significance (0.001, ***). miRNAs treatment of two different breast cancer cells (BT549 and MCF7) displayed differing effects on autophagic flux. In BT549, the cell exhibits low miRNA (200c and 205) expression, whereas MCF7 exhibits high miRNA expression (200c and 205). In this study, we transfected the miRNA-200c-3p mimic, miRNA-205-5p mimic in BT549 and miRNA-200c-3p antagonist, and miRNA-205-5p antagonist in MCF7, respectively. Next, we investigated the effects of miR-200c and miR-205 on autophagic flux in breast cancer cells. In BT549, miRNA mimics successfully inhibited ZEB1 expression, whereas chloroquine 50 uM did not (Figure 3A). miRNA-200c mimic lowered the biomarker of autophagosomes (LC3) in comparison to that of miRNA-205. Chloroquine 50 uM has stimulated both LC3-I and LC3-II expression in BT549. Confocal images show that miRNAs have stimulated a number of autophagosomes, which is quantified by ImageJ. A number of autophagosomes exhibited LC3 expression as indicated in figure 4. Figure 4A indicated the number of autophagosome changes in a 1-day treatment, whereas figure 4B indicated the number of autophagosome changes in a 2-day treatment. The summary of autophagic flux is in figure 5 and table 4. The numbers of autophagosomes stimulated by miRNA-200c were consistently 3 per cell in 1 and 2-day treatments, whereas the miRNA-205 was stimulated on day 1 in the amount of 4 per cell and decreased to 2 per cell in 2-day treatment. The chloroquine treatment increased the number of autophagosomes to 5 per cell consistently in 1 and 2-day treatments, with statistical significance. In MDA-MB-231, miRNA mimics have successfully inhibited ZEB1 expression (Supplementary Figure 1). Interestingly, miRNA-205 mimic lowered the biomarker of autophagosomes (LC3) in comparison with miRNA-200c. Chloroquine 50 uM has stimulated both LC3-I and LC3-II expression in MDA-MB-231. The confocal images show that miRNA have stimulated the number of autophagosomes, which are quantified by ImageJ. A number of autophagosomes exhibited LC3 expression as indicated in supplementary figure 1. Supplementary figure 2 indicated the number of autophagosomes changes in a 1-day treatment, whereas supplementary figure 3 indicated the number of autophagosomes changes in a 2-day treatment. The summary of autophagic flux is in supplementary figure 2 and supplementary table 1. The number of autophagosomes stimulated by miRNA-200c and miRNA-205 with 1-day treatment were 4 per cell and 3 per cell, respectively. miRNAs (200c and 206) treatments had shown dramatically reduced back to basal level after 2-day treatment. The chloroquine treatment increased the number of autophagosome to 10 per cell and 5 per cell in 1-day and 2-day treatments with statistical significance. In MCF7, miRNA antagonists have successfully stimulated ZEB1 expression, whereas chloroquine 50 uM did not significantly increase statistically based upon analysis (Figure 3B). Interestingly, both miRNA antagonists did not stimulate LC3 expression compared with chloroquine 50 uM, which stimulated more significantly in LC-II than LC3-I in MCF7. This study revealed that miRNA-200c and miRNA-205 did not significantly alter autophagic flux compared to a FDA-approved drug (Chloroquine-CQ) in the BT549 and MCF7 breast cancer cell types. The process of Epithelial to Mesenchymal Transition (EMT) is believed the driving force to promote early invasive cancer growth by changing the cell morphology. ZEB can be regulating by miRNA 200 and miR205 family members, respectively [23,24]. MicroRNAs (miRNAs) are short non-coding RNAs that regulate the function of target genes at the post-transcriptional phases. They it has been suggested a therapeutic toward to cancer research. However, there has little information correlate between EMT, miRNAs with autophagy activities. Dysregulation of miRNAs contributes to tumor progression and therapeutic resistance in cancer cells [15,20,25]. Studies have shown that luminal phenotype breast cancer cells (MCF7 and MCF-12A) have higher miR-200c expression compared to basal phenotype breast cancer cells (MDA-MB-231 and BT549) [26,27]. We have used immunoblotting to evaluate the overall autophagic flux in differing treatments within 24 hours. Different breast cancer cells with different genetic composition exhibited different responses to miRNA treatment. 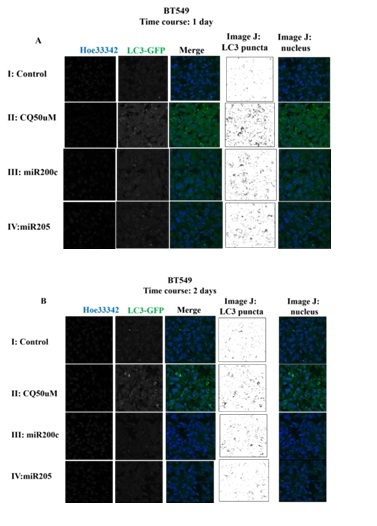 In BT549, miR-200c over expression treatment resulted in decreased lipidation of LC3, whereas the MDA-MB-231 exhibited a reduction in LC-II expression by miR-205, and MCF7 exhibited no autophagic flux changes by miRNA (200c and 205) inhibition treatment. We found that the miR-200c over expression in MDA-MB-231 resulted in decreased lipidation of LC3. These results are similar to those of other studies . To further investigate changes in autophagic flux in the heterogeneity of breast cancer cells, we use confocal imaging to observe. Our results demonstrated the changes in autophagic flux in real time in a time-dependent manner. miRNAs (200c and 205) were shown to decrease the autophagic flux in a 2-day treatment in MDA-MB-231, but not in BT549. It suggested that different behaviors depend on individual genetic composition in luminal phenotype breast cancer. Moreover, the study has shown that breast cancer cell lines possess heterogeneity which varies by cancer stem cell potential and different drug resistance populations . Furthermore, the study also demonstrated that over expression of miR-200c reduced the survival fraction of the MDA-MB-231 and BT549 to radiation, whereas inhibition miR-200c expression resulted in increased survival fraction in MCF7 cells after radiation . It indicates that miR-200c and 205 can serve in different breast cancer cells based on sensitivity in a manner associated with the miRNAs treatment. Autophagy is a canonical pathway in which autophagosomes are fused with lysosomes and degraded within vesicles, and the nutrients are recycled back to cells. Autophagy can serve as a two sided function: it can suppress tumorigenesis  or it can serve as a pro-survival mechanism when cancer cells are subjected to damage by chemical or physical treatments [29,30]. Chloroquine (CQ) has been widely applied and is an FDA-approved drug. CQ is known as lysosome inhibitor which inhibits lysosomes from fusing with autophagosomes. Often, the side effect is cell apoptosis which is not specifically targeted to cancer cells. It has also been shown in our study that chloroquine significantly induces autophagic flux in immunoblotting in 1-day treatments, and confocal images in 1-day and 2-days treatments, respectively. Autophagic flux was also demonstrated in chloroquine-treated samples. This manuscript consists of a preliminary inspection of the results, which indicated additive effects and further investigations are required. Our preliminary results suggested a potential sensitivity to autophagy in certain cancer cells than others, probably due to the heterogeneity between cells. Future experiments to be conducted will determine the cytotoxicity of miRNA treatments to specific cell populations or in a general population. Furthermore, the nature of the combination of chloroquine and miRNAs on apoptosis rate induced by miRNAs treatment will be investigated. Overall, our findings provide induction in autophagy flux is associated with cell death in normal cells and in some of breast cancer cells. It is crucial to understand the role of autophagy in the treatment of breast cancer. In conclusion, our results indicate that the autophagy flux changed in response to miRNA treatment, at least in the first day of treatment. In addition, chloroquine has significantly stimulated the autophagy flux in breast cancer cell lines. These findings are promising, but in consideration of the limits of our investigation, further research is needed before suggesting its use in mechanistic and clinical applications. This study was supported by the Purdue University. Kerr JC, Anderson C, Lippman SM (2017) Physical activity, sedentary behaviour, diet, and cancer: An update and emerging new evidence. Lancet Oncol 18: 457-471. Macacu A, Autier P, Boniol M, Boyle P (2015) Active and passive smoking and risk of breast cancer: A meta-analysis. Breast Cancer Res Treat 154: 213-224. Calle EE, Rodriguez C, Walker-Thurmond K, Thun MJ (2003) Overweight, obesity, and mortality from cancer in a prospectively studied cohort of U.S. adults. N Engl J Med 348: 1625-1638. Cassidy JW, Batra AS, Greenwood W, Bruna A (2016) Patient-derived tumour xenografts for breast cancer drug discovery. Endocr Relat Cancer 23: 259-270. Gugnoni M, Sancisi V, Manzotti G, Gandolfi G, Ciarrocchi A (2016) Autophagy and epithelial-mesenchymal transition: An intricate interplay in cancer. Cell Death Dis 7: 2520. Ding WX, Yin XM (2012) Mitophagy: Mechanisms, pathophysiological roles, and analysis. Biol Chem 393: 547-564. Kim I, Rodriguez-Enriquez S, Lemasters JJ (2007) Selective degradation of mitochondria by mitophagy. Arch Biochem Biophys 462: 245-253. Vives-Bauza C, Przedborski S (2011) Mitophagy: The latest problem for Parkinson’s Trends Mol Med 17: 158-165. Yen WL, Klionsky DJ (2008) How to live long and prosper: Autophagy, mitochondria, and aging. Physiology (Bethesda) 23: 248-262. Levine B, Klionsky DJ (2004) Development by self-digestion: Molecular mechanisms and biological functions of autophagy. Dev Cell 6: 463-477. Macfarlane LA, Murphy PR (2010) MicroRNA: Biogenesis, function and role in cancer. Curr Genomics 11: 537-561. Kurozumi S, Yamaguchi Y, Kurosumi M, Ohira M, Matsumoto H, et al. (2017) Recent trends in microRNA research into breast cancer with particular focus on the associations between microRNAs and intrinsic subtypes. J Hum Genet 62: 15-24. Singh T, Adams BD (2017) The regulatory role of miRNAs on VDR in breast cancer. Transcription 8: 232-241. Singh R, Mo YY (2013) Role of microRNAs in breast cancer. Cancer Biol Ther 14: 201-212. Klionsky DJ, Abdalla FC, Abeliovich H, Abraham RT, Acevedo-Arozena A, et al. (2012) Guidelines for the use and interpretation of assays for monitoring autophagy. Autophagy 8: 445-544. Gibbings D, Mostowy S, Jay F, Schwab Y, Cossart P, et al. (2012) Selective autophagy degrades DICER and AGO2 and regulates miRNA activity. Nat Cell Biol 14: 1314-1321. Chao CH, Chang CC, Wu MJ, Ko HW, Wang D, et al. (2014) MicroRNA-205 signaling regulates mammary stem cell fate and tumorigenesis. J Clin Invest 124: 3093-3106. Wu MJ, Kim MR, Chang CJ (2015) Regulation of microRNA-200c in cancer stem cells. Oncoscience 2: 745-746. Korpal M, Lee ES, Hu G, Kang Y (2008) The miR-200 family inhibits epithelial-mesenchymal transition and cancer cell migration by direct targeting of E-cadherin transcriptional repressors ZEB1 and ZEB2. J Biol Chem 283: 14910-14914. He SJ, Xiang CQ, Zhang Y, Lu XT, Chen HW, et al. (2017) Recent progress on the effects of microRNAs and natural products on tumor epithelial-mesenchymal transition. Onco Targets Ther 10: 3435-3451. Lamouille S, Xu J, Derynck R (2014) Molecular mechanisms of epithelial-mesenchymal transition. Nat Rev Mol Cell Biol 15: 178-196. Sanchez-Tillo E, Liu Y, de Barrios O, Siles L, Fanlo L, et al. (2012) EMT-activating transcription factors in cancer: Beyond EMT and tumor invasiveness. Cell Mol Life Sci 69: 3429-3456. Burk U, Schubert J, Wellner U, Schmalhofer O, Vincan E, et al. (2008) A reciprocal repression between ZEB1 and members of the miR-200 family promotes EMT and invasion in cancer cells. EMBO Rep 9: 582-589. Rüegger S, Großhans H (2012) MicroRNA turnover: when, how, and why. Trends Biochem Sci 37: 436-446. Cochrane DR, Spoelstra NS, Howe EN, Nordeen SK, Richer JK (2009) MicroRNA-200c mitigates invasiveness and restores sensitivity to microtubule-targeting chemotherapeutic agents. Mol Cancer Ther 8: 1055-1066. Sun Q, Liu T, Yuan Y, Guo Z, Xie G, et al. (2015) MiR-200c inhibits autophagy and enhances radiosensitivity in breast cancer cells by targeting UBQLN1. Int J Cancer 136: 1003-1012. Levine B, Kroemer G (2008) Autophagy in the pathogenesis of disease. Cell 132: 27-42. Chresta CM, Davies BR, Hickson I, Harding T, Cosulich S, et al. (2010) AZD8055 is a potent, selective, and orally bioavailable ATP-competitive mammalian target of rapamycin kinase inhibitor with in vitro and in vivo antitumor activity. Cancer Res 70: 288-298. Morselli E, Galluzzi L, Kepp O, Vicencio JM, Criollo A, et al. (2009) Anti- and pro-tumor functions of autophagy. Biochim Biophys Acta 1793: 1524-1532. Figure 1: The overview of the proportional of different type of cancers in female. 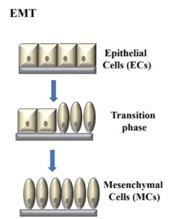 Figure 2: Epithelial-Mesenchymal Transition (EMT) resulted in the cellular morphology changed. 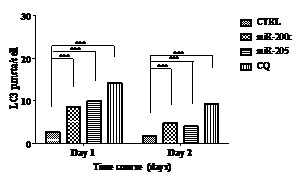 Figure 3: Immunoblotting in BT549 and MCF7 with different 1-day treatments. (A) Shows immunoblotting in BT549, and (B) Shows immunoblotting in MCF7 cells. Figure 4: Immunocytochemistry in BT549 with LC3 staining. A: Represents 1-day treatment B: Represents 2-day treatment. Each treatment consisted of nucleus staining, LC3 staining, image merging, and image quantification ImageJ for LC3 puncta and the nucleus. (I) Represents control; (II) Represents miR-200c-treated; (III) Represents miR-205-treated; and (IV) Represents CQ 50 μM. Figure 5: Histogram showing LC3 puncta in BT549 in 1- and 2-day treatments. Table 1: Biomarkers during Epithelial-Mesenchymal transition (EMT). Table 2: Table indicates different cell lines discussed in this manuscript. Table 3: Different antibodies discussed in this manuscript. Table 4: LC3 puncta in BT549 after 1 and 2 days. Citation: Kao LP, Yang JY, Chang CJ (2018) A Pilot Study-Comparison between miRNA-200c and miR-205 in Breast Cancer Cells. J Cancer Biol Treat 5: 013.